Is your refrigerator turning into a petri dish? I hope not! Refrigerator cleaning is never pleasant, but it doesn't have to be a chore! Why should I spend the time cleaning my refrigerator? (I thought I heard you ask that). . .
A little prevention is worth a pound of hard work later on! You will also save money and have less food spoilage. A clean refrigerator operates more efficiently, you'll save on those energy bills as well! Create space -- Throw out anything old before going to the grocery store. You'll have more room for your perishables and put up the groceries quickly. Wipe Out -- Regularly wipe up spills -- it will save time cleaning later. Blot up as much as you can with paper towels. Use a sponge with warm soapy water to get up the sticky spots. Plan on a good general refrigerator cleaning at least two times a year (spring and fall). Don't use harsh chemicals, detergents or cleaning supplies. Baking soda serves as a great sanitizer, odor remover and brightener. There's no need to rinse afterward (unless you've used too much and there is a residue). If that happens, simply wipe it off with a clean, damp rag. If you use a soapy water mixture, make sure to rinse and wipe dry with paper towels to remove soap traces. Round up your bucket, sponge and paper towels. 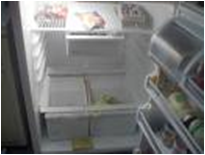 Empty the refrigerator and freezer of all contents (put perishables in another refrigerator or ice chest/cooler). Be sure to group similar products together (salad dressings with salad dressings, etc.). Throw away any spoiled foods or outdated products. Prepare your cleaning solution above. Remove shelves, drawers, crisper bins, etc. Put them in the sink or bathtub. You can spray them with a mild sanitizer and let them soak while wiping out the main compartment. Wipe down walls, door, rubber gasket around the edge of the door. Wash the wire or glass shelves. Place them in the sink or bathtub. Wipe them down with the cleaning solution. Wipe, dry and replace in the refrigerator compartment. Scrub shelves and bins well. Rinse, shake off excess and dry. Return to the refrigerator compartment. Line crisper drawers with paper towels. Return items to the refrigerator in an organized fashion (see item #3 above). Empty refillable ice cube trays and fill with fresh water. Return them to the freezer. Empty automatic ice maker bucket -- start with a fresh batch of ice! Now that you've done all that hard work, keep it clean in between times and save yourself some hard scrubbing later. Wipe all jars, bottles, cans and other containers with a paper towel or clean cloth before putting them back. Rinse and wipe dry fresh fruits and vegetables before putting them in the crisper drawers. Well . . . most refrigerators today are frost free. Defrosting is almost a thing of the past. If you have a more antique version that needs defrosting, be sure to defrost when the frost build up is approximately 1/4 inch. It will save you time. Never use a knife (you can hurt yourself and the appliance). Hope this will make your chores lighter! Check out the information on food safety tips and food storage. Do You Have a Great Refrigerator Cleaning Tip? Do you have a great refrigerator cleaning tip? Share it! Return to top of "Refrigerator Cleaning"